A view of United Nations Headquarters complex in New York City as seen from the Visitors’ Entrance. 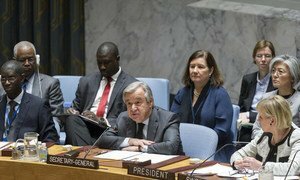 United Nations Secretary-General António Guterres today announced the establishment of an internal review team that will take forward the reforms to the UN Secretariat peace and security strategy, functioning and architecture, which he outlined when he was appointed the Secretary-General last year. According to a statement issued today by the UN chief’s office, the team will be led by Tamrat Samuel, who held numerous senior UN appointments. The review team has been tasked to submit recommendations to Mr. Guterres by June this year, which will then initiate a process of consultations with UN Member States and other relevant entities. “The mandates of Jeffrey Feltman, as Under-Secretary-General for Political Affairs, Oscar Fernandez-Taranco, as Assistant-Secretary-General for Peacebuilding Support, and Atul Khare, as Under-Secretary-General for Field Support, will be extended for one year until the 1 April 2018,” the statement read. Also in the statement, Mr. Guterres announced his intention to appoint Jean-Pierre Lacroix, of France, as Under-Secretary-General for Peacekeeping Operations, for one year beginning 1 April. He is currently the Director for the UN and International Organizations at the Ministry of Foreign Affairs of France and has over 25 years of political and diplomatic experience, mostly handling multilateral organizations, UN activities and programmes. Mr. Lacroix succeeds Hervé Ladsous, who informed Mr. Guterres that he would be unavailable for an extension at the end of its current term, until end-March. “I would like to express my gratitude [to Mr. Ladsous] for his service to the United Nations, his tireless efforts and dedication to peacekeeping, especially in modernizing capacities both to address multidimensional crisis and protect civilian populations,” said Secretary-General Guterres.